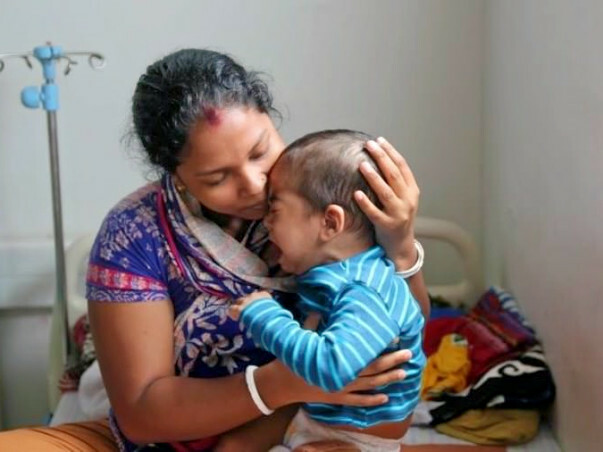 When Biswajit and Chandana celebrated Arnab’s first birthday in their home in Shantipur, West Bengal, they never imagined that a year later their lives would be completely turned upside down. Arnab celebrated his 2nd birthday in the confines of a hospital in Bangalore. Arnab has blood cancer and his condition is critical. The only thing that can save him now is chemotherapy for the next 3 months. Baby Arnab was only 15-months-old when he started getting recurrent fevers. Chandana thought it was a regular fever that would subside in no time. However, Arnab’s condition didn’t improve. She noticed that his stomach was suddenly bloated. On taking him to a doctor in their village, Chandana discovered that her baby was sicker than she imagined. Biswajit and Chandana had no money, but saving their son was their priority. The took him all the way from West Bengal to Bangalore for treatment by borrowing from the people in their village. 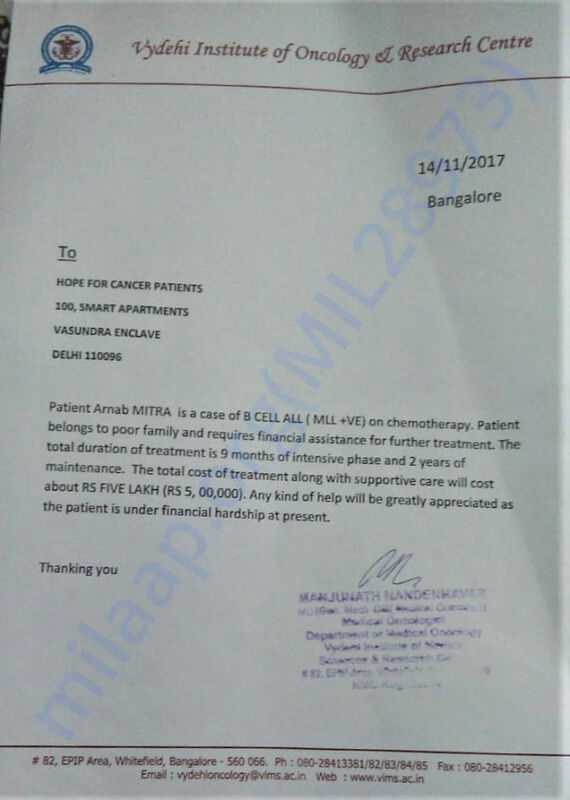 Arnab has been undergoing chemotherapy in Vydehi Hospital, Bangalore for 6 months now. While the treatment makes him extremely restless and cranky, it is his only hope for survival. Biswajit is a daily-labourer who works on other’s farms to earn a living. He’s the sole breadwinner of the family and supports his ailing parents, wife and two children with his income. Biswajit hasn’t been able to work for 6 months now. He is completely dependent on the loan from the village, which has already been exhausted on Arnab’s hospital bills so far. He’s now helpless. Baby Arnab was only just learning to walk before cancer took away his childhood. His parents dream of a bright, healthy future for their little one, while his sister, Tuli (7), is waiting to play with him again. This might never be a reality if Arnab doesn’t get the treatment he needs immediately. Baby Arnab has been suffering from blood cancer for nearly a year now. He will be closer to being cancer-free with chemotherapy. However, his parents can’t afford the 5 lakhs needed for his treatment. They’re already in debt and have no one else to lend them a helping hand. Arnab needs chemotherapy for the next 3 months to live. Your support will help Arnab be free from the misery of blood cancer. Master Arnab was discharged from the hospital on 29th March, and currently he's at home doing well. Doctors had called him again in the month of June for a check-up and after that they will decide if there is any further action required for him. We shall keep you all posted, thank you so much for the love and support which you have shown towards us. The will family is grateful to each one of you. Thank you for the support. Master Arnab is fine now , he finished 5 cycles of chemotherapy in the month of February. First, the doctor said that he needs to get radiation now he says that he doesn't have to get radiation because he is small and is alright. Now, he is not in the hospital he is discharged on 29th March. Please pray his health and his speedy recovery. Thank you for the wonderful support. Arnab is doing better now compared to earlier. He has undergone the 5th chemotherapy cycle two days back and is responding positively to the treatment and has no side effects as such. Thank you for the support. Will keep you posted about his health. Please pray his health and his speedy recovery.